Candidate Abby Finkenauer with Minnesota Senator Amy Klobuchar in Waterloo. Former Vice President Joe Biden will headline a rally in Cedar Rapids tomorrow night for Abby Finkenaur, the Democrat challenging Republican first district Congressman Rod Blum. Fred Hubbell, the Democratic candidate for governor, will share the stage, too. “He wants to help get Democrats in Iowa and independents and people who are interested in change motivated and out to vote,” Hubbell said this weekend. The event is billed as a rally to encourage early voting. Hubbell said it also will help motivate the volunteers who’ve been working for Democratic candidates. “The more energy, the more enthusiasm you can give to people, the better chance not only they, but their friends and neighbors will vote,” Hubbell said. Finkenauer, who worked for Biden’s 2008 Iowa Caucus campaign, met with campaign volunteers in Waterloo and Dubuque this weekend. 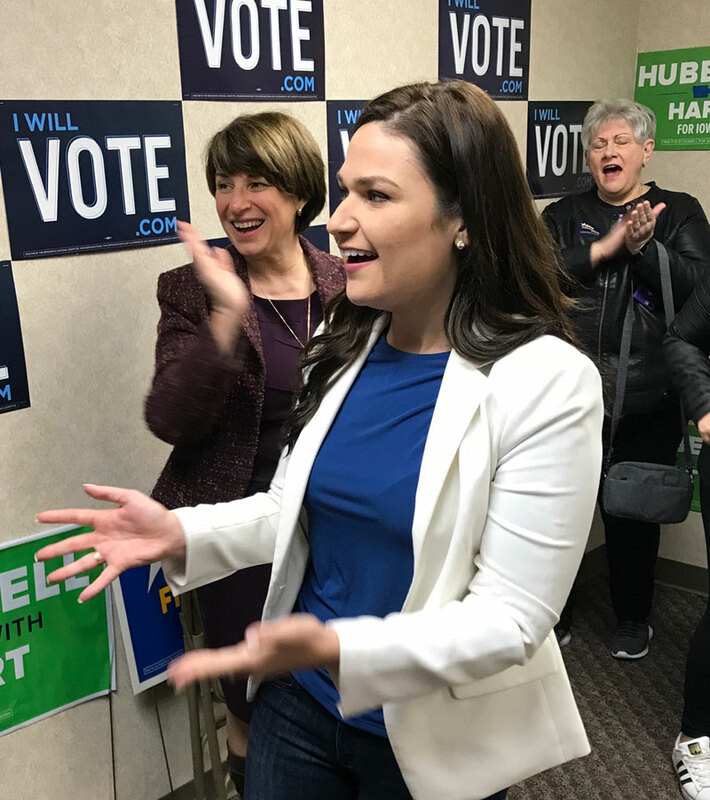 “We cannot take this for granted and we’ve got to continue to work our tails off here,” Finkenauer told a crowd of volunteers in a Black Hawk County Democratic Party office in Waterloo. The latest data on early voting in the first congressional district indicates Democrats have an edge in absentee ballot requests. As of Friday, 34,037 Democrats have already voted, compared to 23,381 Republicans and 15,265 no party or “independent” voters in the first district. Congressman Blum campaigned with Senator Chuck Grassley on Friday and with Senator Joni Ernst on Saturday. President Trump’s travel schedule leading up to the election has been released and it does not include another trip to Iowa. Trump headlined a rally in Council Bluffs earlier this month.